Our Pan Asian brunch experience at Tao Peng extended past the usual dim-sum, Thai curry, sushi experience — especially at dessert time, when we were served a wasabi ice cream. But more on that later. The extensive five-course brunch menu has been curated by Chef de Cuisine Tenzin Phuntsok, who aims to take diners on a journey through Chinese, Thai, Korean, Vietnamese and Japanese cuisine. We start with a spread of classic Cantonese dumplings — the prawn har gow is perfectly steamed with a mix of shredded shrimp and greens, which turns out to be quite relishing. 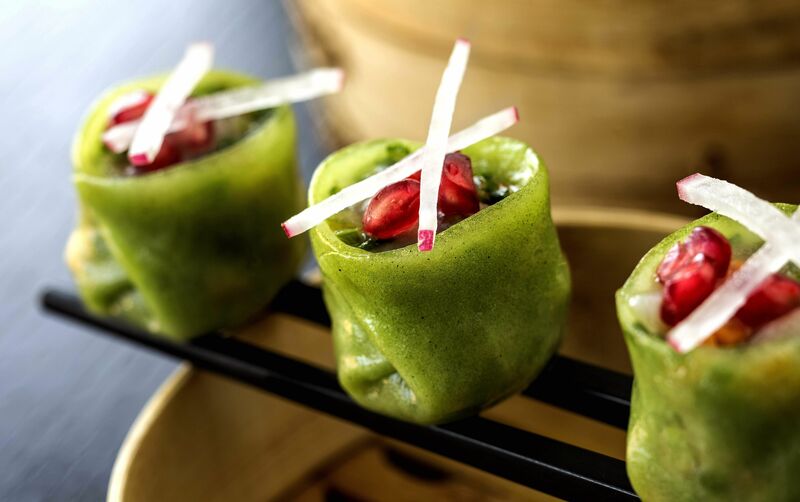 The Truffle Edamame dumplings come next and is an instant favourite, because the truffle does not have an overpowering flavour on the dumpling, just like we hoped for. Even with the Chennai heat soaring, the Tom Yum soup which comes next is unavoidable. The Thai soup is served with prawns, and is comforting with every swig, as it has a burst of flavours from the mix of kaffir lime, lemongrass and chilli flavours, which we love so much. Having our fill of dim sum and soup, a platter of mouthwatering eel, crab stick, and salmon sushi appears next, but without the classic nori sheets. The Eel sushi (Shirayaki), which is partially crisp, with a sweet and salt taste, is delicious. The crab stick (imitation meat) sushi is cured white fish (surimi) which is made to look like the leg of the crustacean. The mildly sweet taste appeals to our palate after the eel, before we savour the classic salmon temaki, which is a good choice for first-timer sushi eaters. If you do choose to give sushi a skip, there are several options with red meat and seafood. Take your pick from the Lemongrass rubbed Lamb Chops and 12-hour cooked Pork Belly, as it turned out to be the highlights of our meal. While the lime-flavoured tender lamb falls off easily from the bone, the crackled pork belly is heavenly, as the meat melts in our mouth instantly. A traditionally sweeter Mapo Tofu or the Stir Fried Exotic Greens and the deliciously crisp Lotus Root tossed in soy sauce are good variations for vegetarians in a largely non-vegetarian fare. They can be coupled with a mildly spicy Cantonese Fried Rice, a simply Steamed Jasmine Rice or the Stir Fried Noodles. With desserts in all shapes and sizes, try the Cantonese Crispy Sesame sphere or the citrus Mandarin Ice Cream. If experimenting with food is on the cards, then the Black Bean and Vodka ice cream is definitely worth a try, because it is unlike most ice creams, as it has a salty yet mildly heady flavour, which makes for quite an interesting end. Dine at Rs 1,999 plus taxes per person.